We are closing in on the last days of school (eight more days), and the last days of my teaching life (a bittersweet thought, which I am mostly avoiding). Each day is a reminder to walk into our classroom with eyes and heart wide open for those moments I know I will want to hold onto and remember when I no longer have a classroom full of sixth graders bursting to the seams with energy, angst, imagination, and feeling. I am holding on so fast that I cannot even bring myself to write about our daily life and learning, as I so religiously did, right here on this blog, for so many years. In a way, nothing has changed from the years past. These last days of life in Room 202 look no different from the last days of school for as long as I can remember: my kids are working on their multi-genre writing projects, on their slave life historical investigation projects, and then we come together to share a last read aloud. Our room is mostly quiet as we work (students and teacher) to write/revise/clarify/elaborate/rethink our writing pieces. From time to time, we forgo the Google docs conferences via comments for the old side-by-side, knee-to-knee variety from the beginning of the school year. We work for two periods, some times three, without a break. There is an air of purposeful intensity in the air: we have meaningful work to do, and a limited time to accomplish it all. We have been preparing for this time since the first day of school: a time of independence, of self-direction, of knowing how to go about the business of managing one’s time and shaping one’s work. …now, I know, my work is done. Teachers talk a lot. Part of that is in the nature of the work we do, but part of that is also due to the fact that most of seem to feel far more comfortable in the role of speaker rather than listener. Even when we listen, it often seems to our students that we do so with our own thoughts foremost in our minds. Our kids can tell. First, they become reluctant to share their thoughts (after all, what is the point? ), and then they revert to doodling and checking the clock instead. It is boring to listen to one voice for the entire length of a class period, because listening is only one small part of either engaging in learning or caring about the endeavor in the first place. I learned to listen, to wait for my kids to muddle through thinking and formulate their ideas, to honor their efforts so that they felt empowered to keep trying. Listening goes and in hand with noticing. Our kids show us a hundred important things in small ways. Their world weighs upon them every bit as much as ours, perhaps even more because they have so little control over their world. The act of noticing can be life changing, even life saving. Of course, noticing can be messy; once you notice you are compelled to respond, to get involved. In a school setting, involvement can mean time, paper work, meetings…in addition to all the other things in our school day which require more time, paperwork, and meetings. But, our kids make the effort to listen and notice so worthwhile. Respect is one of those words we teachers bandy about with great frequency; we require it of our students without much of a sense of true reciprocity. There are so many ways in which our kids see their daily interactions with us as a litany of disrespectful acts: we waste their learning time with irrelevant anecdotes from our personal life and meaningless “seat work”, we ask them to speak politely and take their turn even as we often are dismissive of what they have to say, interrupt their responses, and are quick to be sarcastic or curt. We expect them to understand the pressures we face in our own school lives without taking the time to know how stress is part of their lives, as well. We assign tasks that are easier for us to grade but simply boring and mechanical to do. My kids taught me that respect given them is earned in return, which made our life together all the more pleasant and productive. Kids rise to the occasion when we give them meaningful work. Even when the work seems beyond their sixth grade grasp, my kiddos will reach for it every time IF they feel that the work has meaning and relevance. Kids want to be taken seriously, to be given the opportunity to rise to high expectations, and to have the satisfaction of (to quote Teddy Roosevelt) “the chance to work hard at work worth doing”. Students deserve to know why their learning time should be spent doing this or that, and how the task connects to and extends the learning that came before. I jettisoned workbooks and worksheets long ago in favor of student centered (and often designed) work, and I have my students to thank for that move. Working hard at work worth doing is a learned thing. Even my most industrious students struggle with organization and pacing. It took me time to learn this, and time to figure out the best way to teach the “how” of our work. I learned to teach process, to model different strategies of process, and to make that sort of work as visible as possible. My students taught me that I needed to make sure that they had consistent practice in this kind of habit building, and that their failures were turned into opportunities to fine tune these habits. I will always be grateful to the students who pushed me out of comfort zones (mine as well as the school’s) to answer the “why do we have to know this?” questions. They taught me that the social studies lessons I had labored to devise would be soon forgotten unless I could make those lessons relevant to the world outside our building. In truth, my students taught me that this question was the foundation upon which to build all our learning – it’s the one that opened doors of interest, curiosity, questioning, and wondering. If I could answer this question, I’ve found, my kids would remember what we we learning, and their learning would therefore matter. No matter what had happened the day before, my kiddos always walk in to class each day expecting new chances to learn and grow. They’ve taught me to leave yesterday’s grievances at the door when I first turn on our classroom’s lights and think about the day ahead. Each new day is a chance for me to be a better teacher, a chance for them to better students, and that has been an incredible gift. Thank you, Smithlings, for lessons learned…I will carry them with me always. It’s been a long day, I am teacher tired, and there are lessons for tomorrow which still need tweaking. In other words, I am just about resigned to the idea that yet another Tuesday would pass without a slice of life entry. But a moment from today is still much on my mind, and in my heart; it’s a moment that has prompted this line of thinking for me today: what do I really teach, and what do they really learn? I’m not sure what prompted this, because our morning was pretty run of the mill: we talked, we read, and we wrote: the basics. It was not a great teaching morning, I did not catch myself reflecting upon any one moment as being a particularly brilliant or transformational. It was just another learning day in our classroom. But, the longer I’ve been pondering K’s note, the more I’ve come back to this question: what do I teach, and what do they learn? As teachers, our plan books are filled with lessons culled from the very best PD we can find; we try to fill each learning day with as much good teaching as possible, always on the lookout for our kids’ learning needs and how we are going to meet them (clearly, K. still needs to work on her spelling). And, yes, they are tuning in to as much of those carefully crafted lessons as they can on any given day…depending on what else is going on in their lives. K.’s sweet note had such an impact on me. Her words reminded me that the true power of our teaching lives can most often be found between the lines of our lesson plan books: the side conversations, the quiet moments, the way we choose to bring “real life” into our classroom life. It’s the basics, true, but also the answers to these questions: what do I teach, and what do they learn? This week, we will think about something that we need to make more of: a tradition of empathy, beginning with right here at our middle school. Please watch the two videos, and then post about the following: what does empathy mean to you? what can you do to practice empathy here at the middle school? how can teachers be empathetic to students at our school (do NOT discuss homework in this context, think beyond the question of just homework, please )? Romy: Empathy can change the world, but we have to make it happen. To me, empathy means a path to a better world in which people don’t have to feel invisible, hurt, or scared of everyone around them. 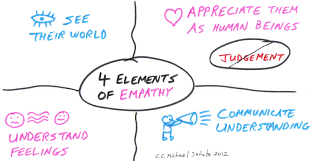 Empathy is showing compassion and consideration for the people around you. People can be empathetic by showing kindness and respect each other, understanding that people are different and we should not judge others unless we are in their shoes. You have to care about others but to do so for your own self and not to get noticed. Empathy is a choice we make and it comes from within. Empathy can always be improved, but we have to “practice” it. We can do this in our middle school by caring and being kind. For example, if someone is sitting alone during lunch or outside, we can invite them to join us. Also, if you seeing someone being made fun of, you can stand up for them and let them know that they are not alone and that you care. Finally, our teachers can be more empathetic towards the students at our school. Teachers can do this by understanding that not all students learn the same and some students need more time to learn. Teachers can also be more patient when listening to students because sometimes students go through rough times and need to be able to talk to someone. This can make it hard to concentrate and teacher should be more considerate and patient because of that. Isabella: To me, empathy means showing love, and showing care. It means that the simplest act of kindness like giving a smile or saying “hi” can change a persons day, change there week, or change their life. They could walk through the door and see their parents fighting in one room, and siblings fighting in the next. At the end of the day no matter how terrible they feel they will remember that someone noticed them. I think teachers here at the middle school could be more empathetic starting with student-teacher relationships. It should be our job to let our teachers know what we’re going through at home and how we feel. They’re not going to know if someone’s parents are getting divorced or someone passed away. I think if our teachers knew how we felt then we would all be understood a little bit better. I believe that there is empathy in all of us deep down inside, and I think that we just need to step up, and show it. Emilia: Teachers can also take part in helping. They should always be open to talking to the student who is feeling lonely or left out. They can also talk about more to convince students to have empathy. Another thing they can do is be more aware. Teachers can do that by keeping a better eye out at lunch. If they did that then they could catch students that are feeling alone or being made fun of. Natalie: I think teachers can feel empathy for their students when a student is looking tired. Usually, teacher will say this “Please get to work,” what they should really do is walk up to the student and make sure everything is ok. If teachers really want their students to be honest with them they have to try to open up to the student. Ben: I think teachers at our school should be more empathetic to their students. If a teacher yells at somebody one day, they should put themselves in the children’s position. What if the child had family issues outside of school. What if they were being bullied that day. How would they feel if they got yelled at? The student already has enough problems to worry about, and the teacher is just making them harder to solve. Norah: A lot of kids think that not giving homework is the only way for a teacher to show empathy towards a students, but it’s really much more than just that. Teachers should put themselves in students’ shoes by understanding that kids aren’t going to sit still completely quietly for the 7 hours of the school day. Some of my teachers are kind, but only a few, I feel, can really understand their students. Only a few are able to make some jokes to cheer up a student, or answer a student’s question, even if the teacher already answered it, because they understand how one little thing can make a kid’s whole day better. Emily: Before watching this video, I believed that empathy was showing respect and kindness to another person. But when I finished viewing the two videos, my thinking completely changed. Now I think that showing empathy means to put yourself in that person’s place and to consider your actions. As I read through and left comments for each of my fifty students, I felt so much better about the “holiday I wants” – and I felt that I had learned a thing or two about being an empathetic teacher, as well. One of the very best things we can do for our young writers, is to invite in the voices of gifted and passionate writers. Many of our students (especially in middle school) are quite vocal about how much they dislike writing, and it is always an eye-opening experience for them to meet writers who have given over their lives to the very venture they wish to avoid: sitting at a desk, and writing, writing, writing. Why? they ask. Do you ever get mad and just hate it? they wonder. Do you ever want to quit and just do something else? they persist. I can see looks of skepticism, the old middle school talent of eye rolls to express disbelief., when it emerges that actually, no, the writer is doing exactly what he wants to do, even though there are moments of deep frustration. But, and this happens every single time, at the end of our time with the invited author, my students have come around to a place of belief in the idea that writing can be purposeful, enjoyable, and even life-sustaining. Today, George O’Connor told our students that he first became interested in mythology, when he was in the third grade. Obsessed with Hermes, Oconnor did his first ever book report on this Greek god, and delivered it to his class costumed as Hermes. What struck me about this story was the way his teacher permitted him to write about a topic that was clearly his abiding interest – there was no injunction to rely only on whales or dead Presidents. And O’Connor’s family was also accepting and nurturing of his passion to draw and tell stories, it was a family saying that, “Georgie is going to grow up and tell stories with pictures.” With that kind of support, it’s no wonder that he did, or that he had the persistence to keep at it until his passion also became his life’s work. O’Connor also made it a point to tell our students that they should not be so quick to erase their drawings: “I don’t erase, when you erase you eradicate your mistakes. But, it is important to make mistakes and learn from them. When I draw, I sketch quickly, then I go back to trace over just the lines I really like- the ones that really work.” Listening to this, I thought of the application of this wisdom to the writing process, and how important it is to tell our students to cross out rather than erase – to value the first attempts because they gesture toward the final products, and reveal the path of our thinking. O’Connor demonstrated his quick sketching, which is something of a marvel to behold. I could see that my kids were impressed at the speed at which he worked, and the fact that the outcome (in under a minute) was pretty darn good. When one student asked if O’Connor had ever thought of ditching writing because he was clearly so good at drawing, he said something that made my kids sit up a bit and pay attention: “Drawing is much easier for me, when I write something the work is much harder, but that’s what makes it more rewarding. ” That hard work (which writing definitely is) can be rewarding is a message my sixth graders need to hear time and time again…especially from an author they so admire. The end of the first marking period has arrived, and with it, piles of stuff to sort through and assess. Project based learning combined with reading and writing workshop present a particular kind of challenge, for you are assessing the process not just the end product…and that takes a LOT of time. Many years ago, when I first arrived at our middle school, it occurred to me that it would be helpful to ask my students for some reflective feedback about MY performance as a teacher. After all, they were with me every day for three periods and three different subjects, so it would stand to reason that they would be in the best position to offer just the kind of real time feedback that I sorely needed. I remember that my kids were flabbergasted at the idea of grading me (for that is how they saw it, of course), but, given permission to be honest and tell it like it is, their surprise turned into a purposeful glee. The task I set for them was to first reflect upon the highs and lows of the marking period, and use the latter to set new goals for the next marking period. Then, and this was the part they loved, I asked them to write about their teacher, me: in what ways could I better address their learning needs, where could my performance be better? Turns out, sixth graders are great evaluators. They notice everything, they weigh the good with the not so good, and when they are asked to, they share with insight, honesty, humor, and kindness. I learned a lot then, and I continue to do so. They asked for more time to read (is there ever enough in one school day? ), and more opportunities to free write, and made suggestions about poets to look into and books to buy for our classroom library. Some noted that I walked around less (true: my old lady woes of fibromyalgia and arthritis often get in the way) which they “kinda missed”, and all wished I would type up mini lessons as handouts because their handwriting was such that they had a hard time reading what they had written down (story of my life as their teacher, I will have to say, because I have this problem, too!). I love the care with which they thought and wrote, I love how carefully they folded their letters and handed them in with tentative smiles, and I love how this gesture on my part seemed to mean so much to them. My children listened, and it was lovely to know that they were watching, too…as it happens, I learn which way to turn and what to be by listening to them, too.